Wow, our free felt making workshop in the village was quite an event on Saturday morning! We had more than 100 people come in and make felt, the majority for the first time. There were so many people that we kept having to put out more tables for them to work at and then so many more, that the visitors started putting the tables up themselves as we couldn't keep up with showing the tables and demonstrating felt at the same time. I don't have many pictures, because I didn't get much time to take any - I was too busy helping people to make felt. It was lovely to see some many people involved and enjoying making felt. It really is so tactile and genuinely suitable for all: the youngest person there was only 4 weeks, although she didn't make anything, but a 2 year old did. Lots of people made small individual pieces, which they took home - I suggested to many it would make a great gift for Mothers Day next Sunday (unfortunately, I was too busy to make any for my own mum - Sorry Mum! ), - many made little felt balls, which could be cut open later to reveal their jewel like colours and lots contributed to a large scale hanging, which is going to be displayed in our local health centre, when I stitch on the hanging mechanism. The large piece has an underwater theme and it was great to see adults as well as children contribute, in all the stages of laying out the background, add the fish and the felting. It is now out of my bath, where I had been washing out the soap and is drying slowly. To get in the mood for the event, I made my own large piece, which I will be revealing shortly when it is finished. It is felted, but I still want to stitch on it to complete it. It was helpful for the big event, even if only to tell me that making it on the floor was a bad and back breaking idea - we used tables for the workshop. We don't have a big enough table at home, but that may guide the maximum size of felt I am willing to make in the future! It's been a busy few days as it was also our youngest's 4th birthday on Thursday and we held her birthday party this morning. We forgot that the clocks went forward today, so it was an early start than anticipated to get things ready for 10.30 (9.30 in the old time is far too early for a Sunday!). They all had fun painting mugs, decorating cakes and running round the garden. I'm now exhausted! FAB, our new local art group is having its second free art event on Saturday 26th March. We are making felt: large and small pieces and we are trying to organise a place for it to be on permanent display in the village. I'm surrounded by bags of wool tops ready for the workshop and I'm currently felting a large piece to show people how it is made. Pictures of it soon. Actually, I'm doing this to delay getting back to rolling my felt - it is certainly a good workout for my weak arm muscles! If you are in the area, please drop in and join us. 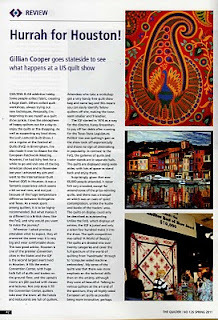 I was very excited to receive the latest issue of The Quilter magazine last week as it includes an article I wrote about the International Quilt Festival in Houston. 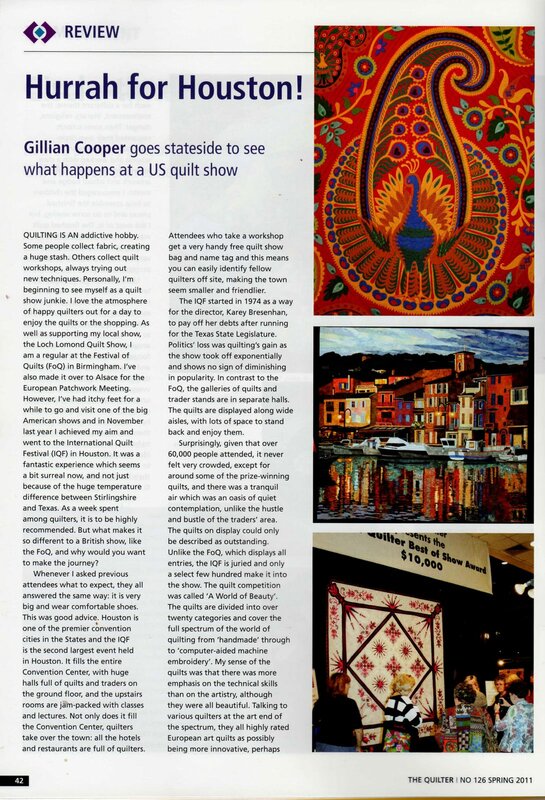 It's the first time I've written for The Quilter, which is the magazine of the Quilters' Guild and although I've written lots of articles over the last eight years, I still get a childish thrill from seeing my words and photographs in print. It's also lovely to share my enthusiasm for something I have really enjoyed with lots of other people. Whilst pondering my ideas of forgotten goddesses and looking at ancient statues, I realised I wanted to add in some idea of time passing in my work. How things change and yet they don't. Once we are gone the sea will still be there, crashing the waves onto little changing rocks. For our February half term holiday, we went to the Northumbrian coast, an area of amazing beauty and mesmerising seas. These photos were taken yards from where we stayed - it was even sunny for a few days. It was a lovely break; very relaxing and we did little except let the children fill their wellies with water each day (how did they manage it?!) and enjoy the wood burning stove at night. I love being by the sea and was already missing the sound of it before we had even reached home. Now I have to work out how to incorporate the waves into this work. 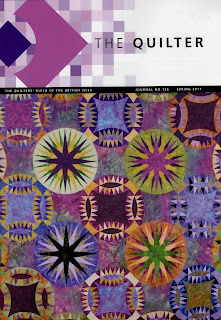 I'm now well and truly immersed in creating my new work for the Festival of Quilts. I still have a number of variations mulling around and I'm trying some out to see how they work. These samples were made using scraps of fabric, fabric paint, stitch, paintsticks and stencils, layering and quilting. 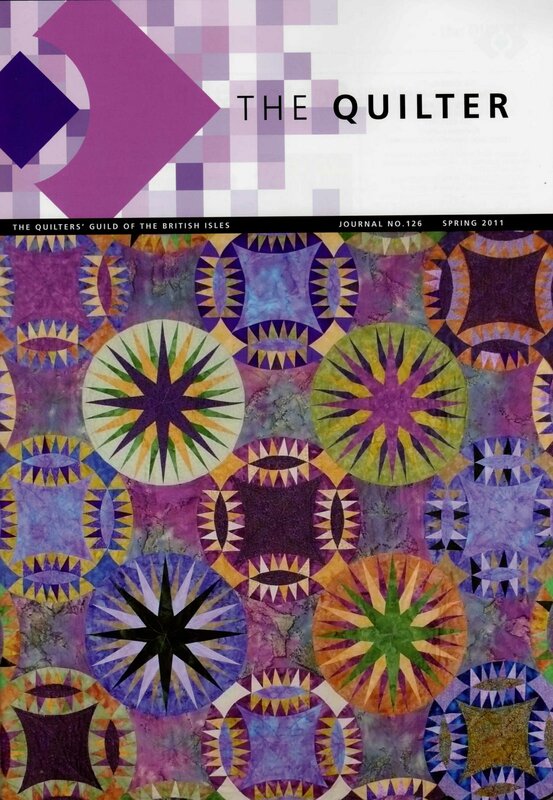 As well as playing with the designs, I'm also trying out different variations of quilt sandwich to see how they work. These used fusible wadding for the first time and it did hold it together well, but I'm not convinced it would work on my final pieces as this wadding splits a bit and this won't work if I'm not binding the edges. The stencil took ages to cut and is based on a wave pattern (more about this in my next post or two).